For those of the present generation, the old notion of amateurism v professionalism is uncharted territory. Athletes in the twenty first century find it hard to imagine runners not getting money prizes – even children are able to win money in the Highland Games circuit. But for many, many years money was taboo. The belief, not entirely without foundation in their experience, brought corruption in its wake. In the 1890’s several athletes were banned for accepting expenses and schemes such as ‘ringing’ (several athletes agreeing among themselves to pool their prize money and then share it out between them) and deciding who was going to win were often indulged in. In the twenty first century with big money prizes on offer and obscene financial deals available to winners in the major Games has led to the abuse of drugs, etc. However the knock-on effect on everyday athletes was disproportionate. There is the famous story of the child who won a packet of fruit gums being banned from amateur athletics. I have just bought a book called “The Ghost Runner” by Bill Jones about John Tarrant who had, as a 17 year old got £17 in expenses as a boxer being totally banned from amateur athletics for life. He ran in races, having changed behind a hedge or some trees and more often than not won them. It’s a book worth reading. I’ll come back to him. Some of the situations experienced by athletes of the 50’s and 60’s are recounted below. The latest addition is about the late nineteenth century professionalism and corruption in the sport in Scotland and comes largely from the official history of the SAAA’s by John Keddie. 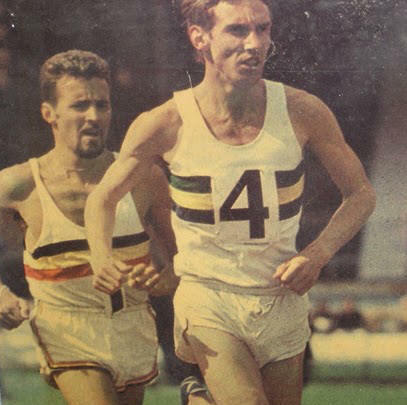 Not so long ago, well maybe slightly longer ago than one would wish, there existed in Scottish athletics a form of apartheid between those who ran for money and those of the so-called amateur code and woe betide those who crossed the great divide. That sounds simple but it was certainly not that. A boy who accepted something like 20p in new money for a Sunday school race could lose his amateur status for life such was the draconian line taken by the Amateur authorities. All this stemmed from the birth of the SAAA in 1883 born as a reaction to corruption in Victorian athletics, sometimes called Pedestrianism, including drugs, betting and race fixing. Nothing new there you may say. From that time to the 1970’s that body (the SAAA) saw itself as the guardian of the amateur code and woe betide anybody who crossed the line. You were not even allowed to compete against the pros even though you yourself did not receive any cash prize such were the “contamination rules”. At one point you could not compete in amateur athletics if you were a PE teacher and professional footballers who went to Jordanhill College to train as teachers could not represent the College at athletics. The professional meetings/games tended to be in the Highlands and in the Borders while the amateur meetings tended to be in the Central Belt. There were exceptions but that was the trend. The professional games were often more amateur in spirit that the amateur meetings. But that was the strangeness of it all. It all hinged round accepting prize money instead of prizes. Even though the prizes could well exceed the prize money, it was the principle. Ways of getting round the rules became part of the folklore. Whilst broken-time payments eased professionalism into soccer, and saw the birth of Rugby League, more devious methods were adopted in athletics. Amateur athletes sometimes ran under assumed names or in disguise at pro games to avoid the authorities. One well-known field events athlete was caught out by his photo appearing in a Glasgow paper even though he had changed his name for the day. Of course at the top level, appearance money also came into play especially in Europe. One well-known Olympic gold medallist appeared in Dublin and proceeded to set a world record for which he was due a substantial purse. Hugh appeared on the Scotsport television programme in 1966 (after all the hassle that Tarrant suffered as described below) and was contacted the following morning by Rab Foreman of the SAAA telling him that any money had to be repaid – Hugh had to send the cheque for £1:1:0 back to STV! The cheque and the letter are shown here – once the link is re-established, for a proper view, click on each picture in turn. John Tarrant was a different case and his story is told in detail in the book referred to above and also in the earlier book produced by ‘Athletics Weekly’ shown here. John as a young man was very energetic and took up boxing as an outlet for the energy and maybe anger at the hand he had been dealt as a child. It was a more glamorous sport than football with long reports on Randolph Turpin v Sugar Ray Robinson and the money available. He joined a local club and did some training, including roadwork, and was talked into a couple of bouts against friends in the same club and a couple of guys from other clubs. 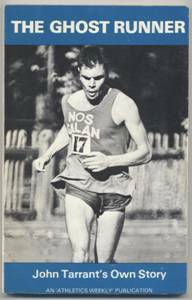 Altogether he gained £17 in expenses before he decided he would rather be a runner – he enjoyed the road work and had a natural talent. That meant joining a club so he applied to join Salford Harriers, his local club. He filled in the application and in the space asking if he had ever earned money for any sporting activity, he swithered for a long time before telling the truth. His form came back with his 5/- membership form – he couldn’t join. The area AAA’s Committee said that since he had been a boxer who had earned money he would have to be cleared by his local Amateur Boxing Association Committee. They had a reciprocal arrangement with them and could not accept him as an amateur unless the ABA gave him clearance. This was not forthcoming. he was desperately keen to run so he turned up at a couple of races in his vest and shorts but covered with a long overcoat and a cap pulled down over his eyes. When the race started he removed the ‘disguise’ and joined in. Officials tried to pull him out of the race without success and he led for most of it. The Express newspaper gave him the title of ‘The Ghost Runner’ because he ran without a number, never appeared in the results and was totally ignored by the establishment. He got on well with the other runners, spectators liked to see him in action and soon promoters realised that an appearance by the ghost added to the attraction of their race. As the momentum built up he was invited to appear on David Coleman’s Sportsnight programme. The interview was sympathetic and at the end he was wished good luck by Coleman. He was contacted by the AAA’s who asked for the money to be repaid! He was not an amateur by their lights but he couldn’t accept money for a TV interview. The sum involved was £1:18:0 [£1:90]. The Gordian Knot of acceptance as an amateur was cut by the recognition, rather late in the day, that since he had never ever actually been a paid up member of the ABA, he didn’t need their clearance! After three years of being a ghost, he was accepted into the amateur fold. [While he was banned and after the big movement for his clearance had really gained momentum, he had been invited to a race and instead of a number he wore a card reading ‘GHOST’] The new book is very good, the AW one is out of print but he was a remarkable man and I can’t recommend his story too highly for anyone wanting to know about the divide and more importantly about this man and his part in helping bring down the wall. So there you have it!!! Hugh Barrow and John Tarrant both had to give back the money paid for a TV interview. The situation did provide some lighter moments – not always for officialdom, however. For instance there was the time when AAA’s supremo Jack Crump went to Ireland in the immediate post-war period to investigate rumours of illegal payments being made to athletes. Following his investigation, he was about to board a flight back to London when somebody rushed forward and thrust a box of eggs into his hand and Press photographer snapped it for the record. The significance? Eggs were still rationed in Britain! No more was heard of that investigation! The Continental take on the ‘shamateur’ business was quite straightforward. 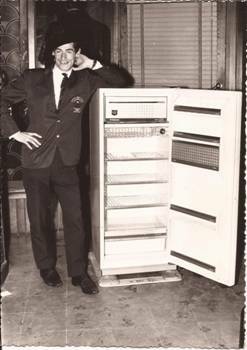 When athletes travelled to their big races, the were awarded prizes such as refrigerators, washing machines, television sets, etc on the Saturday after the race; these ‘trophies’ were then sold at a special sale on the Sunday and the proceeds given to the owner (ie the runner who had won them! The picture below is of Lachie Stewart with his prize from the race at Elgoibar in Spain before he sold it on. TE Messenger (Salford), an Englisg sprinter who received £5 in the name of expenses from a club. (6) ‘Roping’ was spreading and this, together with the betting was found to be demoralising amateur sport.